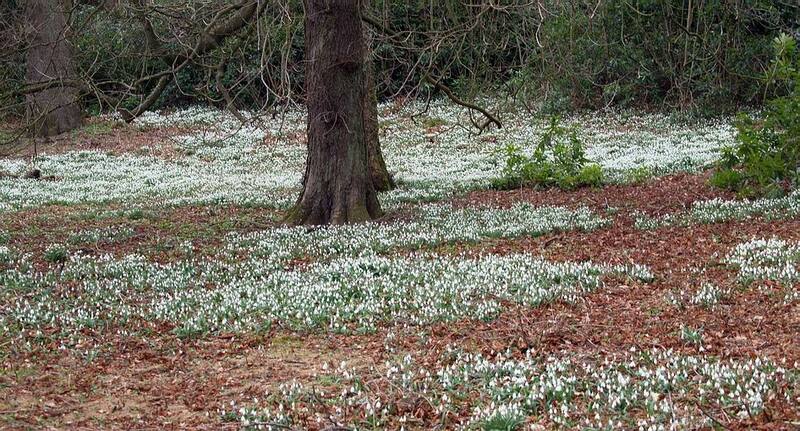 OK - I will own up to having visited a number of snowdrop sites recently and this is the most spectacular for me. 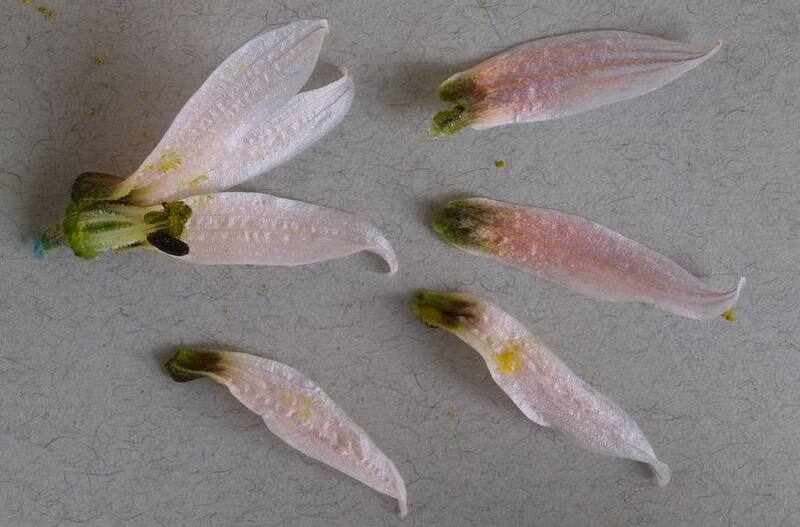 The largest majority of these plants are Galanthus plicatus. G. nivalis is also present as are a good number of hybrids which made this a very special visit. 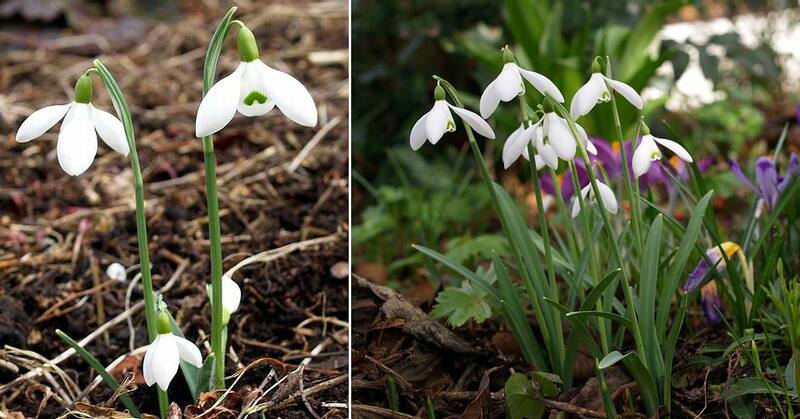 We do have quite a lot of Galanthus in the garden and, no surprise; I much prefer the forms and hybrids of plicatus parentage. They just do it for me with their broad dark green glaucus leaves and substantial flowers also many produce more than one flowering stem per bulb. As to having caught white fever - nah! Now this could be called white fever as I do love my narcissus and this one, Narcissus x susannae, has to be among my all time favourite bulbs. This is the hybrid between N. triandrus and N. cantabricus that occurs in the wild where the habitat of the two species converge. This is one I made myself a number of years ago and it never fails to delight me and everyone else who sees it every year when it comes back into flower. One of the problems of making this and other crosses is that both parents are not always in flower together. 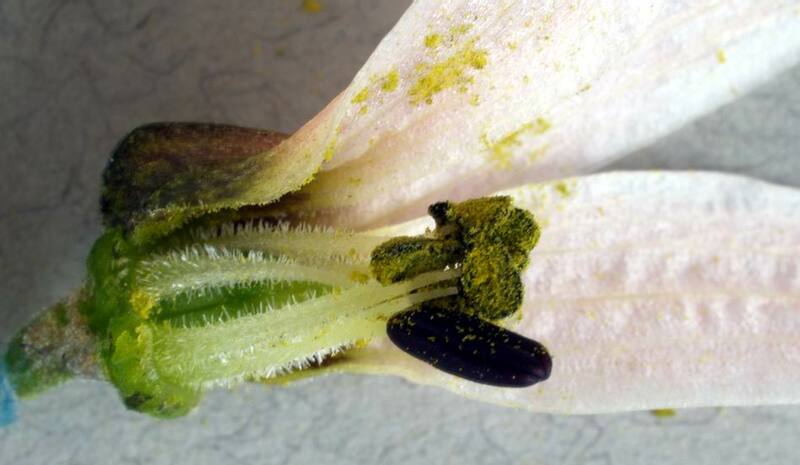 To overcome that problem you have to store the pollen from the earlier flowering plant until the other one is ready. I use the old fashioned film capsule containers - sadly I am running out of these now as I have not used film for over six years. I place a small packet of silica gel in the bottom then some paper tissue or cotton wool and sit the anthers complete with pollen on top of that. 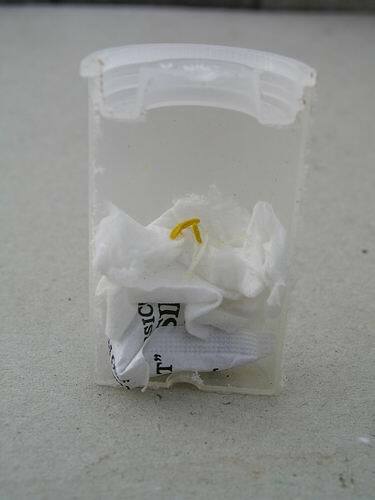 The container is then placed in the fridge where the pollen will remain good for about four to six weeks. 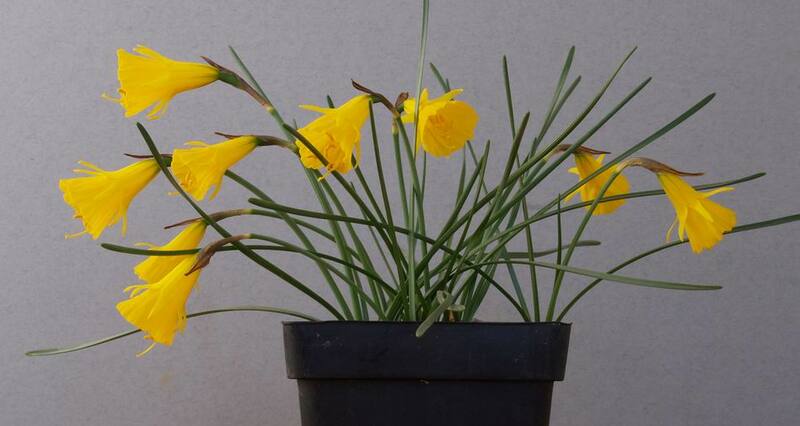 Narcissus 'Mini Cycla' is a long established hybrid between Narcissus cyclamineus and N. asturiensis but I find it rather miffy and difficult to bulk up to any decent numbers. It is one of those plants that I go one step forward with then two back again and I suspect that it has become weakened with age as it has been around for a very long time - it may be it just does not like my growing conditions. However a number of years ago I decided to cross it back on to N. cyclamineus and this pot full is the result. It differs from 'Mini Cycla' in having more reflexed petals - not surprising as it is now 2/3 N. cyclamineus and only 1/3 N. asturiensis - but the main advantage is that this new cross has all the vigour of youth and is increasing well for me. It is not a single clone there are three different clones there. There are many excellent hybrids between N cyclamineus and N. asturiensis appearing now as more and more people are making the cross - they are all lovely dwarf plants. You do not always get what you expect when growing bulbs from seed - this is the first flower from a pot of seedlings labelled Narcissus bulbocodium obesus. It is nothing like the parent so I am left wondering has it crossed with some of the other forms of bulbocodium? 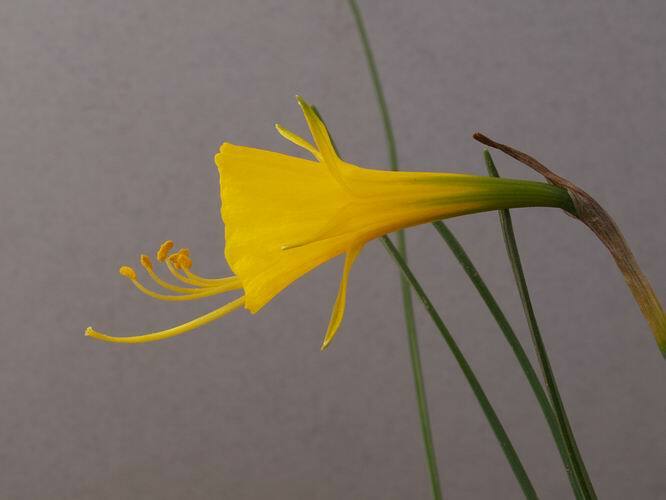 The most likely candidate is Narcissus bulbocodium nivalis which has the much exerted style and anthers or perhaps another species altogether is involved. Whatever it is I do like it. 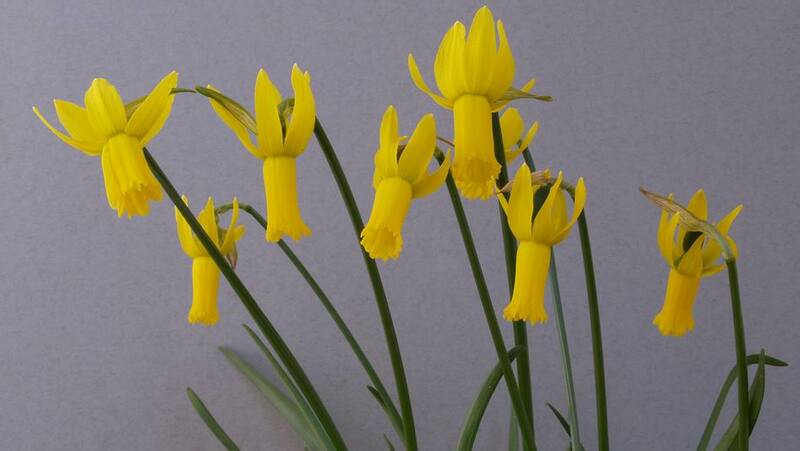 Here is another very nice Narcissus bulbocodium seedling this time a very short one. 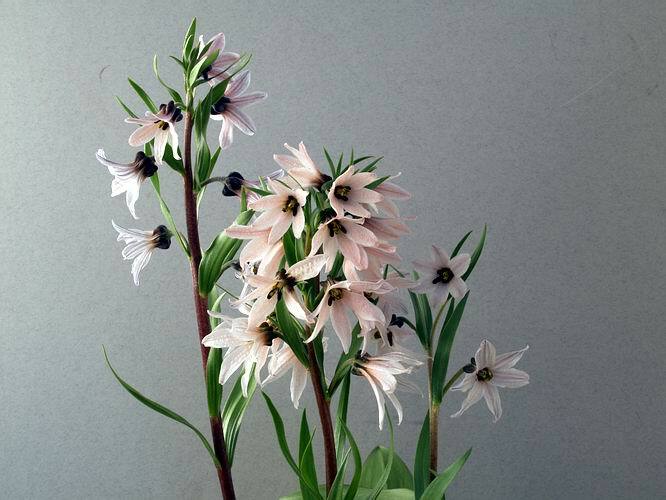 When the flowers first opened the stems were only about 2-3 cms tall - they have since been pulled up by poor light and the competition from the tightly packed pots of bulbs. This is another case of mixed up or lost labels as I do not know what or where the original seeds were from. As I mentioned in a recent bulb log no matter how careful I try to be; when you grow so many pots of plants as we do labels will get mixed, lost, broken or just fade away. Again this is a very desirable bulb with at least one of its parents being N. bulbocodium. 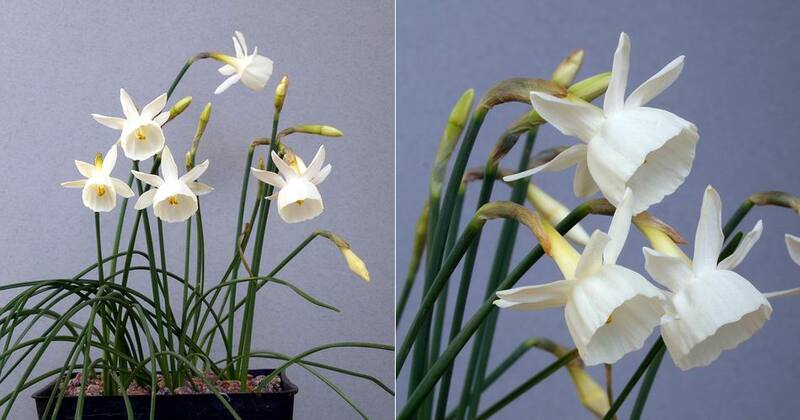 As I enjoy the new flowers opening every day the flowers on many of the early flowering forms of N. romieuxii are now starting to fade - time for the potash feed. Now I am growing all my bulbs in plastic pots it is most important for me to remember to feed early. The plastic pots require much less frequent watering so I have fewer opportunities to give them the extra potassium they need to build up their bulbs and flowers for the next flowering season. See bulb log 07/05 for my full feeding regime. 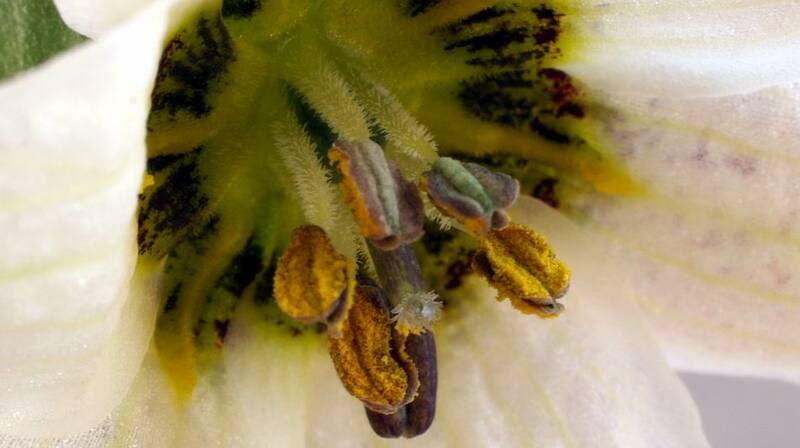 As the flowers fade I add a small amount of potassium in the white powder form to each pot. Then I water through the powder and much of it is washed into the compost, some remains on the surface and gets washed in the next time I water. I have never had any damage done to any mature bulbs using this method of feeding. I do not use it on newly germinated seedlings until well into the season as even dilute chemicals can damage their delicate and sensitive young roots. Yes; the Fritillarias are also coming into flower - this is one of my preferred forms of the very variable species Fritillaria crassifolia. It has short stems which mostly carry two good sized, rounded flowers but one of these has three flowers. The three flowered stem does show signs of fasciation and I suspect it is a merger of a two flowered and a single flowered stem. 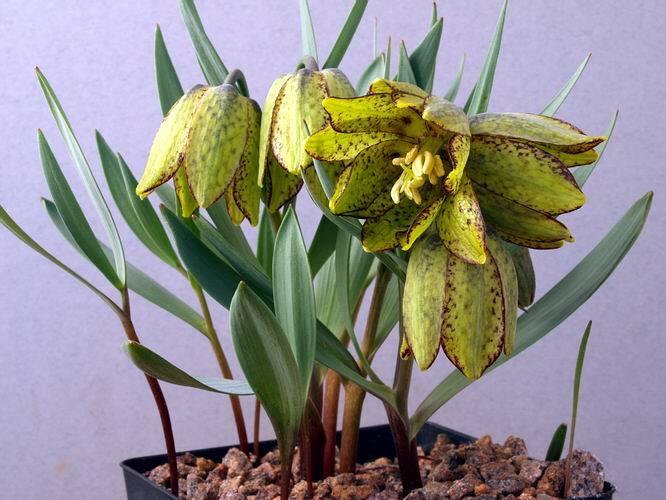 This bulb raised from seed from Gothenberg Botanic Garden confuses me as it is supposed to be Fritillaria karelinii but does not seem to fit in the typical form of that plant. 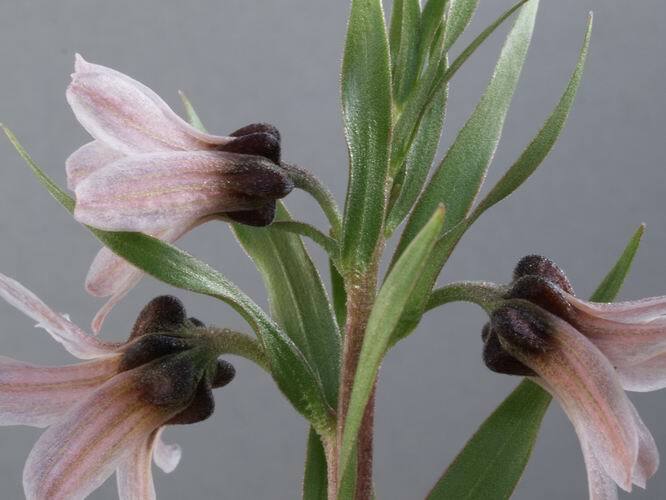 From what I have read there is some confusion in the taxonomy of the Rhinopetalum group of Fritillaria so I may have to wait for an answer. One thing for sure is it is a very beautiful flower. My new Digital SLR and macro lens allows me greater control of my photographs again and I am enjoying getting very detailed pictures so I can study the finer points of the flowers - note the 'hairy' filaments. Another frit from the same group in flower is Fritillaria stenanthera and it also has similar hair like structures on the filaments. As I have often mentioned if you have plenty of flowers on a plant it is always worth picking one and taking it apart to reveal the structure and details of the flowers. These details often include the taxonomic diagnostics used to identify the different species and sub species. The whole Rhinopetallum Group is noted for having very deep nectaries seen here as the 'rhino' like lumps on the top of the floral segments. Having showed you the close up pictures I will now leave you this week with a portrait of the whole pot full.